A Collateralized Debt Obligation (CDO) is a synthetic investment product that represents different loans bundled together and sold by the lenderTop Banks in the USAAccording to the US Federal Deposit Insurance Corporation, there were 6,799 FDIC-insured commercial banks in the USA as of February 2014. The country's central bank is the Federal Reserve Bank, which came into existence after the passage of the Federal Reserve Act in 1913 in the market. The holder of the collateralized debt obligation can, in theory, collect the borrowed amount from the original borrower at the end of the loan period. 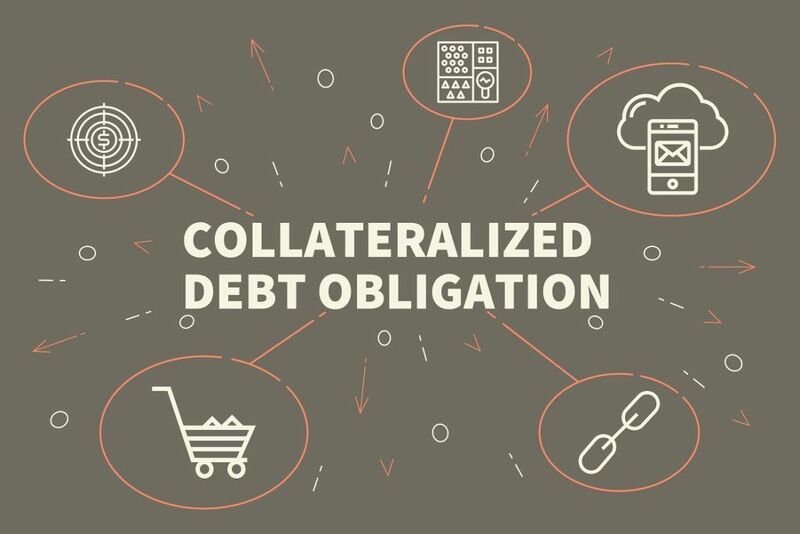 A collateralized debt obligation is a type of derivative security because its price (at least notionally) depends on the price of some other asset. Historically, the underlying assets in collateralized debt obligations included corporate bondsBondsBonds are fixed-income securities that are issued by corporations and governments to raise capital. The bond issuer borrows capital from the bondholder and makes fixed payments to them at a fixed (or variable) interest rate for a specified period., sovereign bonds, and bank loans. A CDO gathers income from a collection of collateralized debt instruments and allocates the collected income to a prioritized set of CDO securities. Similar to equity (preferred stockPreferred SharesPreferred shares (preferred stock, preference shares) are the class of stock ownership in a corporation that has a priority claim on the company’s assets over common stock shares. The shares are more senior than common stock but are more junior relative to debt, such as bonds. and common stockCommon StockCommon stock is a type of security that represents ownership of equity in a company. There are other terms – such as common share, ordinary share, or voting share – that are equivalent to common stock. ), a senior CDO security is paid before a mezzanine CDO. The first CDOs comprised cash flow CDOs, i.e., not subject to active management by a fund manager. However, by the mid-2000s during the lead up to the 2008 recession, marked-to-market CDOs made up the majority of CDOs. A fund manager actively managed the CDOs. Collateralized debt obligations allow banks to reduce the amount of risk they hold on their balance sheet. The majority of banks are required to hold a certain proportion of their assets in reserve. This incentivizes the securitization and sale of assets, as holding assets in reserves is costly for the banks. Collateralized debt obligations allow banks to transform a relatively illiquid security (a single bond or loan) into a relatively liquid security. Historically, houses were seen to be fundamentally different from other assets such as bonds and shares of companies. Therefore, the housing market was analyzed in a different way compared to the market for other investment instruments. Transactions in the housing market are usually high-value transactions involving individuals, and the relative frequency of such transactions is low compared to a bond or share, which may change hands multiple times during a day’s trading. In 2003, Alan Greenspan, then the chairman of the Federal ReserveFederal Reserve (the Fed)The Federal Reserve, more commonly referred to The Fed, is the central bank of the United States of America and is hence the supreme financial authority behind the world’s largest free market economy., cut the target federal funds rate to 1% from a high of 6.5% in 2001. The move incentivized banks to increase lending to take advantage of the easy credit available. Banks also provided housing loans to borrowers who would not usually qualify for mortgage loans in the past. A mortgage-backed CDO owns parts of many individual mortgage bonds. On average, a mortgage-backed CDO owns parts of hundreds of individual mortgage bonds. The mortgage bonds, in turn, contained thousands of individual mortgages. Thus, a mortgage-backed CDO is seen to reduce the risk of a small-scale housing crisis by diversifying across many mortgage bonds. A mortgage-backed CDO was considered a very safe investment instrument prior to the 2008 financial crisis. However, such CDOs were particularly susceptible to a systemic collapse of the global housing market. In 2007-2008, house prices fell across the world. Volcker RuleVolcker RuleThe Volcker Rule refers to Sec 619 of the Dodd-Frank Act, which prohibits banks from engaging in proprietary trading, or from using their depositors’ funds to invest in risky investment instruments. The rule also prohibits banks from owning or investing in hedge funds or private equity funds.